It’s amazing how reliant we have become on cell phones. I use mine to make calls, send messages, write blog posts and to tell the time. I no longer wear a watch because my mobile phone fulfils that function. The other day I was meeting a friend for lunch. My phone needed to be reformatted due to an error and it was linked to my computer. I could not detach it so I had to leave it at the office while I headed to the shopping centre where we were meeting. We hadn’t made a firm time so I arrived before the 12:30ish arrangement and sat at a table in the area outside the place where we normally get together. It took my friend 25 minutes to find me even though I was where we said we would meet. Not being able to contact each other made me aware of how reliant we are on our phones. Also, I had no clue how long I had been waiting as there was no clock near me. Some people are so attached to their phones they text while trying to drive. This makes me lose my temper and yell out my car window at them, or gesticulate and shake my head. I so don’t want to be part of their accident! Now, when tempering chocolate using the seeding method you won’t have any reason to yell. Celia has an extensive post on how to do this. Here is my shortened version. I hardly use my phone for calls at all – but I’m glued to it! Great instructions. This is great! Tempering chocolate is NOT something I have mastered yet, but really want to! Reliant on cell phones…. I have a serious addiction. I lost my phone the other arvo for about 30 minutes, was fretting. It was ridiculous. Not a fan of those who text and drive either, very dangerous. I might not be happy if my phone was lost! we are so reliant on cell phones!! I was just watching a TV show that takes place in the 1960s and I was just thinking how hard it would be without a cell phone!! haha… also, these chocolates look amazing! YUM! Oh! So the magic temperature is 31C…I will definitely remember this next time working with chocolate. Hope this method works for you! I am with you on the cell phone use, while I try to limit the time I spend on mine, I am not always successful. I once forgot it at home and al day I felt like I am missing something, its almost like a body part, always by my side, funny! On the other note, love the recipe, and would love to give it a try, never tried making tempered chocolate! I don’t think I would cope not having my phone with me all day! I definitely don’t like to leave home without my cell phone. 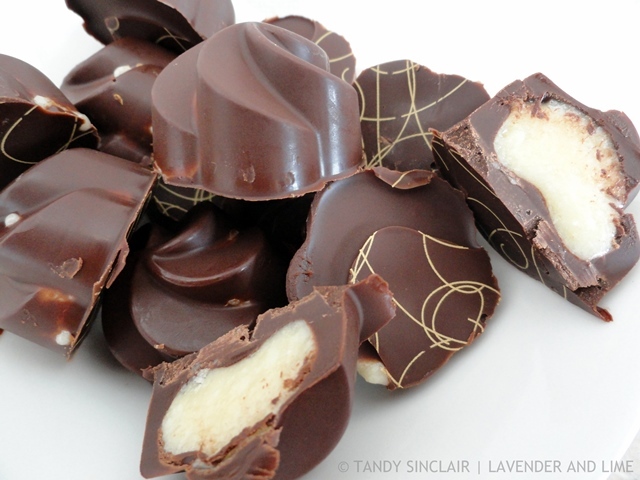 Tempering chocolate can be tricky – great tips! Oh wow, I want to get one, but they are not available here! This chocolate looks scrumptious! And yes, it seems we are so reliant on cell phones! Do we own them or do they own us? I just melted chocolate today and used your method without even realizing it. 🙂 I’m so glad it worked!